After packing away the Christmas decorations for another year, the living room can be left looking a bit empty so now is the time of year to redecorate. However, a lot of people don’t know where to begin so our friends at Sloane and Sons have shared their five design tips to help you create the perfect living space as well as offering you the chance to win a Tub Chair. 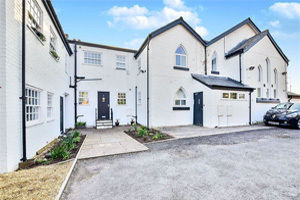 One of the first things you need to do when redecorating your living room is make some changes to the furniture, as this is the main focal point of the room you need to select the pieces carefully. You don’t need to change all your furniture to make a huge difference to the design. You should add a few statement pieces into the room such as a quirky coffee table or a Sloane and Sons Stylish chair which will stand in prime position and will catch a guest’s eye as soon as they walk in the room. Just upgrading to a few new pieces of furniture will make all the difference before you start getting the paintbrushes out. You can even move furniture around in the room. Placing them in different positions will help the room feel fresh and new again. Lighting might be the last thing on your list when redecorating your living room but lighting can lift the room and help it to become an inviting area for you and your guests. Therefore, do spend time choosing lighting which will look perfect in your living room. You want a light shade which helps to create a comfortable atmosphere for those cosy nights in during the cold seasons. You also want light which helps to show off your gorgeous wallpaper. Choose something which will blend well with the new décor and go for a combination of different light sources. For instance, a pretty light shade and table lamp can create a cool look in your living room. It’s easy to put your focus on the big stuff in your living room such as the furniture and the wallpaper when redecorating. After all, they are the main focal points which need a lot of your attention, but you must not forget about the small details. They help to complete the room and can lift the look with a trendy, unique feel. We are talking about those cute accents which bring a pop of colour to the room. Whether that is a small set of photo frames in a bright colour or a beautiful vase which boasts a unique pattern, these small items are what can really bring life to your living room. Art is also an important addition to a living room. When redesigning, find places in the room to add a compelling piece. You could even add several pieces across your wall to give the living room a touch of modern decor. The windows also need some attention when you decide to redesign your living room. The window coverings need to blend well with the rest of the decor in the room, you don’t want your curtains to clash with the wallpaper. Therefore, make sure you take a sample of your wallpaper to the shop with you when buying your curtains. You want the window dressings to also complement the style of the room. If you are going for an elegant style, you could go for floor to ceiling drapes which will add a touch of luxe to the room. If a modern style is more your thing, you could go for blinds in a quirky pattern to dress your windows. Before you start designing your lounge, you need to first choose a colour palette for the living room. You don’t want to start buying bits that don’t match when all placed together. When choosing a colour palette, it’s worth thinking about what mood you want to create in the living room. If you want a calming effect, it’s worth looking at blue and green hues. Red and yellow can give the room a boost of excitement and a thrilling atmosphere. If you are thinking of decorating again in the future, go neutral so you can make changes as necessary. Our friends at Sloane & Sons are helping you on your way to redesigning that perfect lounge by giving you a chance to add a stylish chair to your living room. 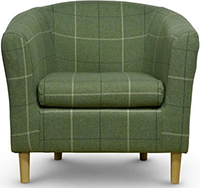 Enter the competition below to win the Morris Green Tartan Fabric Tub Chair.